Just last month a ruptured oil pipeline flooded an Arkansas neighborhood with more than a million gallons of dirty tar sands oil and water. Our friends at the League of Conservation Voters are asking the State Department to help prevent future accidents by rejecting the dirty and dangerous Keystone XL tar sands pipeline. Please sign their petition today to help reach one million messages by Earth Day. Tell Secretary of State Kerry and President Obama to reject the Keystone XL pipeline! Enough is enough! Join us in saying NO to more tar sands spills. Help us reach one million comments against the dangerous Keystone XL tar sands pipeline. More than 500,000 gallons of tar sands oil and water just spilled in Arkansas. Don’t let this dirty oil nightmare ooze across America. Imagine coming home to this: Oil oozing down your driveway, pooling in your back yard, and filling up your local waterways. Sounds like a nightmare, right? This is the reality that families in Mayflower, Arkansas, have had to deal with since more than 500,000 gallons of dirty tar sands oil and water spilled out of a ruptured Exxon Mobil pipeline this past Friday. This spill is terrible and our hearts go out to the community in Mayflower affected by this disaster. This shouldn’t have happened. That’s why it’s critical that President Obama and Secretary Kerry reject the construction of a much bigger pipeline, Keystone XL, which could cause even more devastating spills of tar sands crude in waterways and lands across America. We need you to raise your voice now. Tell the State Department to keep us safe from more tar sands spills by rejecting the dangerous Keystone XL pipeline! Unfortunately, the spill in Arkansas repeats a story we know too well. In 2010, an Enbridge Energy pipeline in Michigan broke and spilled more than 800,000 gallons of toxic tar sands crude into the Kalamazoo River — and it still hasn’t been fully cleaned up. That same year, TransCanada, the company that wants to build the Keystone XL pipeline now, built a pipeline that experienced 12 separate spills in a single year. In 2011, one of Exxon Mobil’s pipelines in Montana ruptured and contaminated the Yellowstone River. And even just last week, a train derailed in Minnesota and spilled 30,000 gallons of tar sands crude. If these stories make your stomach churn, I know how you feel. It’s absolutely infuriating that we keep allowing Big Oil to put our lands, water, and wildlife at risk, when we have seen over and over how it ends. Right now, the State Department is accepting comments on its review of the potential environmental impacts of the Keystone XL pipeline. The initial draft of this review was completely off-base, downplaying the risks of spills and the devastating impact that this dirty oil would have in fueling climate change. Luckily, we have the chance to weigh in on this draft and push them to change it to recommend what many scientists have attested to — that this pipeline is too dangerous to build and the tar sands oil needs to stay in the ground. So we’re joining with groups across the environmental movement to gather one million comments opposing the dirty Keystone XL pipeline by the end of the comment period on April 22. With only 4 days to go, we need you to send a message now. Thanks to contributions from more than 3,000 LCV members, we hit our goal in our fundraising drive for this campaign and now we’ve got all the resources we need to win this fight. But we can’t do it without your help. So thanks for taking a moment to make your voice heard today. A 9th grader in Silver City has initiated a petition addressed to the Interstate Stream Commission asking that the Gila River water not be diverted and piped to Deming (by way of the copper mines near Silver City) in order to facilitate development. Will you consider signing the petition at http://www.change.org/petitions/jim-dunlap-chairman-of-the-interstate-stream-commission-don-t-divert-the-gila-river-through-the-awsa-2? Revisions to the Aamodt Litigation Settlement Act dragged on for two years as the parties to the settlement had to go back to the drawing board and make the language in the 2006 act conform to the 2010 federal act that approved it (as well as the Cost Sharing and System Integration Agreement). These agreements were completed earlier this year and when Secretary of the Interior Ken Salazar came to New Mexico, the settlement was signed on March 14. Meanwhile, the Environmental Impact Statement (EIS) for the Pojoaque Basin Regional Water System (RWS), which will deliver the amounts of water stipulated in the settlement to the pueblos (Tesuque, Nambe, San Ildefonso, and Pojoaque) and non-pueblo residents of the Pojoaque Valley, is generating some speculation as to how and if it can be completed by September 15, 2017, the date by which the terms of the settlement must be fulfilled. The Bureau of Reclamation (BOR), charged with the promulgation of the EIS, has scheduled two additional scoping meetings for Wednesday, April 17, at the Tewa Visitor Center at the Pueblo of San Ildefonso; and Thursday, April 18, at the El Rancho Community Center. Both meetings will run from 6 to 8 p.m. Comments will be accepted until May 3 and can be submitted by email, regular mail, fax, or on the web as well: e-mail to PojoaqueBasinEIS@usbr.gov; mail to Bureau of Reclamation, Albuquerque Area Office (ALB-842), 555 Broadway NE, Suite 100, Albuquerque, NM 87102; fax to (505) 462-3797; or Submit a Web Comment Here! See the Bureau of Reclamation web site for more information. The settlement stipulates that approximately 4,000 acre feet per year (afy) of water will be diverted from the Rio Grande: up to 2,500 (2,381 afy reflects conveyance loss from the original 2,500 afy) to the pueblos and up to 1,500 afy to Santa Fe County customers, who can voluntarily become members of the delivery system or retain their private wells. The water sources are: San Juan/Chama Project, 1,079 afy; Nambe Reserved Right, 302; a transfer of water rights from Top of the World Farms (TOW) in northern Taos County, 1,752; and domestic well transfers, 611 (reduced from 750). Of the 1,079 afy San Juan/Chama water, 300 afy was taken from the Taos Pueblo Settlement (Abeyta) in a negotiated deal, and the remaining 800 afy are Cochiti Lake Contract water rights that were set aside to compensate for evaporation. The 611 afy is an estimate of the maximum potential of domestic well transfers into the water delivery system. The water will be taken from the Rio Grande, most likely at San Ildefonso Pueblo, by either diverting the surface water into a side intake structure or by collecting groundwater that is hydrologically connected to the river through the use of horizontal collector wells or infiltration gallery. This idea of a collector was first put forward back in the late 1990s when the County of Santa Fe proposed that a Ranney Collector be used to divert Top of the World water rights (600 afy) to the Buckman Well Field to offset over pumping and allow for future development. The county’s application to transfer the TOW water rights was protested by nineteen groups and individuals concerned that the transfer could open the door to other municipalities and development interests hoping to acquire water rights in northern New Mexico and transfer them to other locations south of the Otowi Gauge. There was also concern that the infiltration gallery would affect ground water supplies in a wide radius of the pumping. The 1999 transfer was never completed, and eventually, after the County purchased an additional 1,100 afy of TOW water rights, the water was designated for the Aamodt settlement. Now that the settlement has been signed, the County and the Department of the Interior, which bought the portion of the Top of the World water rights intended for the pueblos, will apply to the Office of the State Engineer to transfer them, a process that will no doubt be extended due to many anticipated protests from groups and individuals in Taos County. 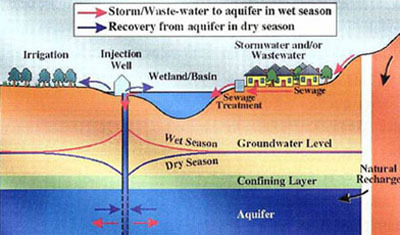 While the Santa Fe County web site states that the diverted water will be treated at a water treatment facility and transmitted to storage facilities, either storage tanks or underground aquifers called Aquifer Storage and Recovery (ASR), it appears that because of cost concerns the ASR, where water is injected into underground aquifers for storage and then recovered when needed, will be used for the water system. This concept has become more common in the last 10 to 15 years, largely because of its economic benefits—as opposed to the capital outlay for a reservoir or storage tanks—and because of already depleted aquifers that the injected water can help restore. The BOR will have to prove the feasibility of the proposed ASR system by drilling wells to make sure the contained system won’t mix with other aquifers. All of this is going to cost a lot of money, of course, and the bill for the RSW is steadily climbing from the original $163 million (as stated on the Santa Fe County web site) in 2006 dollars to over $200 million today. While cost increase indexes are factored into the settlement legislation, many of the original estimates for various components of the project, including the ASR wells, may be well below actual costs. Another major concern is that as the drought continues the imported water slated for the settlement—both San Juan/Chama and TOW—may end up being paper, not wet water. And members of the Pojoaque Basin Water Alliance (PBWA), a group of non-pueblo valley residents who have consistently opposed the water delivery system to non-pueblos residents (see article in La Jicarita), are wondering if the County of Santa Fe, which will be responsible for operating the RWS for the first 10 years, has the capacity to enforce the terms of the agreement. • Is the original hydrographic survey, completed in 1964, adequate to determine the proper location for the proposed ASR wells? • If restrictions are put in place that limit the amount of water that can be removed from the river where will the replacement water come from? • How will pharmaceuticals be removed from the river water? • Will there be a need to build more power lines for the pumping stations and filtration plant and will they all be underground? Will new substation/stations be required? • What would prolonged drought and lack of San Juan Chama Water do to affect the regional water system? • How would other challenges to Rio Grande water rights (Texas claims, Elephant Butte challenges, priority calls on the Colorado River) including protection for species such as the silvery minnow affect the regional water system? • Are the Top of the World water rights actually connected to the Rio Grande? • How will contaminants from Los Alamos such as airborne particulates be treated? • The Aamodt Settlement was touted as a non-discriminatory process, however Chupadero and other communities along Route 592 were left out of the planning for the water utility. Will there be additional federal funding for a water utility along this corridor? The Aamodt adjudication suit was filed in 1966; if the terms of the settlement are fulfilled by 2017 the process will have taken 51 years. Santa Fe, NM – April 11, 2013 – Below is a summary of the actions taken by the Santa Fe Board of County Commissioners (BCC). Commissioner Mayfield was excused, but participated for portions of the meeting by telephone. The Consent Calendar was unanimously approved. The March 12, 2013 BCC meeting minutes were unanimously approved. Amendment No. 1 to the building lease agreement with Women’s Health Services for the use of additional office space located at 901 W. Alameda, Santa Fe, New Mexico and to authorize the Chair of the Board Of County Commissioners to execute said agreement No. 1 and to obtain approval from the New Mexico Board of Finance for Amendment No. 1 was unanimously approved. BCC CASE # MIS 12-5420 College Park Master Plat Authorization – Unanimously approved (4-0, Commissioner Mayfield did not participate in the vote) – Please note this was Master Plat Authorization, not master plan approval. The BCC Packet is available online by clicking the BCC meeting event on the Events calendar or visiting the BCC committee page www.santafecountynm.gov/committees/board_of_county_commissioners_bcc. All approved Ordinances and Resolutions are available on the County website at www.santafecountynm.gov/ordinances_and_resolutions once they are approved and recorded. All BCC meetings are broadcast live at www.santafecountynm.gov, on Comcast Ch. 28 and on Que Suave AM 810. To view recorded video of this BCC meeting visit www.santafecountynm.gov/video_on_demand/. Transcripts of the meeting will be available within 10 working days at www.santafecountynm.gov, once approved.